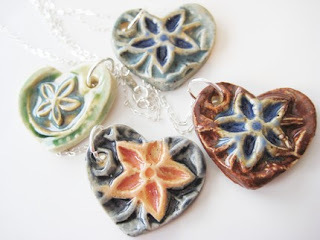 This week's EtsyInspired shop is Make Mine Mud By Little Miss Pottery. Melissa is the owner and she makes the most amazing items! 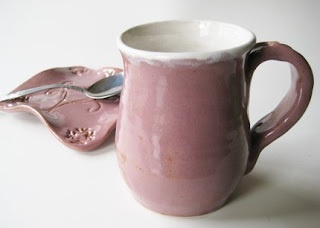 She makes pendants, tiles, bowls, spoon rests, candle plates, jars, vases, platters, cups, and so much more! I love her beautiful earthy colors and fun color combinations. I also really love the flowers, hearts, and leaves designs on her pieces. The intricate details make each piece seem so special! 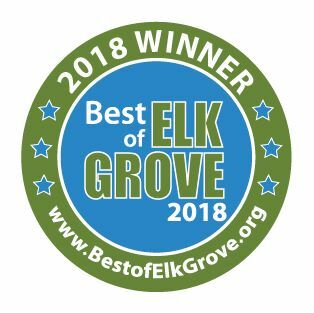 Also, there's a little something for everyone on your shopping list in this shop like jewelry for the ladies, kitchen items for people who like to cook, and decorative pieces for anyone! This week is REALLY special. Instead of offering a prize to just one person, Melissa has decided that ANYONE who orders from her shop and mentions EtsyInspired in the comments section of the invoice will get a FREE pendant! (I've posted a picture below of some of the amazing pendants she has to choose from.) How generous is that? This is with ANY purchase! But of course, we have to have a prize for the winner of EtsyInspired right? OF COURSE! The winner will receive Unity's So and So Loves single from me. To win the prize, all you have to do is go the the Make Mine Mud shop and pick out any item to be inspired by. Make any creation that you wish and link it back here to this post by Friday April 17 at noon Pacific time. A winner will be chosen by random drawing. Now, go be EtsyInspired! Also, don't forget that if you want to enter to be June's guest design team member, you just need to participate in each challenge for the month of April. At the end of April, I will have a post asking who would like to enter for the guest DT position, all you have to do is post on that and you will be entered. A winner will be chosen from all the participants the first week of May. Here's my card for this week. 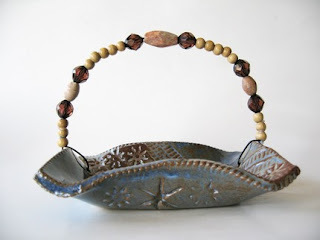 It is inspired by the cute trinket holder in the first picture of this blog post. Again, I went clean and simple. I sponged over my Cuttlebugged paper with Chocolate Chip ink. And I colored the rhinestones brown to kind of imitate the handle on the trinket holder. Simple must be in this week Ashley my card is much less involved than normal too!!! I like the CB embossing and the distressing with the ink even if you did have to use Brown!!! :-( LOL!!!! Great take on the Inspiration pieces!!! Ashley! I love this! That "basket" piece was one of my faves and I love how you did the sponging on the card. The Live Simply quote is my fav from March's KOM from Unity! Beautiful! This is so pretty Ashley. I love the embossed background and the sponging. Very pretty Ashley! love the embossing on this...I think we were on the same wavelength making our creations!! Great shop this week!! I can't wait to play!! I love the card! The brown over the embossing is fabulous! And the sentiment says it all! Really pretty! 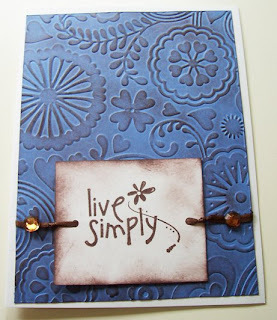 I love what you did with the embossing...it totally reminds me of the great pieces in her shop! Love your take on this challenge. Beautiful card and love the techniques you used. Love the way you sponged the CB folder. Simple yet effective. Ashley this is awesome!! :) Great job hun! What an awesome card!! Very nice! I'm so glad I had a chance to play along this week! I had fun with this one! I linked the inspiration pc on my post! ... Joyful Stamper: A Distressed Penelope! Love what you did with your card Ashley! Hi Ashley, I love your cuttlebug chocolate chip card. I love the combination of blue and brown together. I am new to your group, I made a card for the challenge, I hope I find the right place to post it. If not it is on both of my blogs. Here I am with my Etsy Inspired Challenge #31! I enjoyed this challenge- and once again, the object of my desire disappeared before I could purchase or link to it! However I can link you to my entry- it is here http://lauriewe.wordpress.com/2009/04/15/etsy-inspired-challenge-31/ Can't wait to see what next weeks shop is- so many great places to visit. Well...Better late than never, Ashley! Here is the link to my card! Thanks for a great challenge! OK, very late, so hopefully you will forgive me.